A Pink is a rarity in K-pop. In a music industry known for its kaleidoscopic melding of genres and concepts, they have remained consistent throughout their seven years on stage. On 2nd July the group returned with One & Six, their first mini album of 2018. Its lead single “I’m So Sick” revealed an unexpected departure from their signature soft, flirty style. This comes as a surprise when A Pink has established a strong fanbase by playing it safe. What this strategy lacks, however, is room for growth and depth in both their sound and image. Newer, fresher groups whirl through a range of concepts in the race to make their mark. In comparison, A Pink’s discography appears repetitive. The group are missing opportunities to show fans their range, which puts them in danger of falling behind competitors and music trends. Is this too little, too late? Or could “I’m So Sick” set the stage for a bright new chapter in the group’s career? From the opening shots, it’s clear that this MV aims to set itself apart from A Pink’s cute canon. The palette is tinged with pink, but trades pastels for a darker tone that melds monochrome with splashes of deep red. 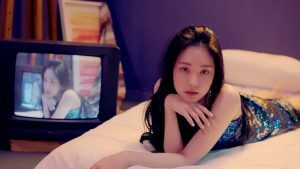 Naeun’s intro, spoken in English, hits just the right blend of sad and sultry to pull the audience into a compelling storyline. Even if it wasn’t A Pink centre-stage, this is an MV that raises the bar for sophistication. The fact that it’s the six girls we are used to seeing running through flower fields or baking cupcakes makes it all the more striking. The video begins with the members entering the set, fatefully ignoring the arrows that point in the opposite direction. It’s an image that both sets out the downward spiral of the song’s mood and draws the audience into “I’m So Sick’s” dizzying mix of motifs. This disparity between appearance and reality is evoked in the music video’s imagery. While Naeun curls in bed, lazy and listless, she watches her own image displayed in a fuzzy TV screen. Later on, Bomi engages with the viewer in a similar fashion, throwing one of her crumpled letters directly into the lens. It’s an interesting take on voyeurism, that hints at the way the members are struggling to face up to the truth of their own feelings. The song is about a fading love and the swirl of emotions that comes with loss. A Pink could have been merely heartbroken, or bitter and fierce – but this gentle, true-to-life depiction of the apathetic dissipation of romance runs deeper, giving them the edge they need to pull off their own twist on a more mature style. We see a repeated pattern of symbols scattered throughout, in the props and styling. Namjoo and Chorong face down decadent plates of untouched food, Hayoung wanders in a mess of flowers, while Bomi sprawls among discarded letters and vinyl records from popular romantic movies, in an indie take on the theme. Yet Eunji is the most striking. Alone in a room filled with photographs, she toys hopelessly with a roll of film. These sets all serve to reinforce the idea of love turned stale, of memories lost, and the styling slots in perfectly with the bittersweet mood. Naeun, Eunji and Bomi all wear glitzy, glam slip dresses in a striking departure from their usual girly costumes. Each is barefoot, her heels abandoned beside her. Perhaps waiting for a date who will never come home or possibly deciding to call it quits and stand him up. 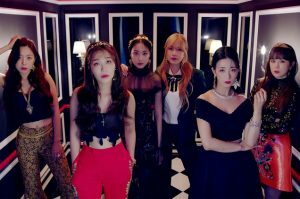 The group’s new, bolder look is best showcased in the choreo scenes, when each member dons outfits in black and crimson. It’s the little touches – like Naeun’s slicked-back hairstyle, or Bomi’s bright-red lipstick, that cement their new image. 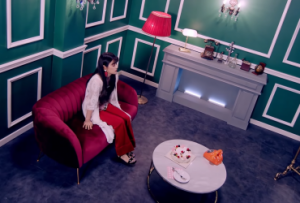 The tension rises as the song builds, and the symbols keep stacking up – they’re all on-point, like the dice bursting into flames, or Hayoung and Naeun’s close-ups rippling and blurred by rain. Namjoo drops a delicate key into a glass of water as the track plunges into its second chorus, to watch the liquid tremble as if preceding an earthquake. The MV is almost overcrowded, with the camera flitting through each moment too swiftly for the images to linger on the viewer’s mind. It’s the same key used in the title shot just before the MV opens, and a nice repetition of Eunji submerging her crumpled film in the sink. Is she intent on destroying the memories? Is Namjoo letting go of the key to her heart? As the dice smoke, could A Pink’s risky move to end their relationship prove disastrous? We don’t get the time to wonder, which is a missed opportunity. If just a handful of these scattered images had been brought to the fore, A Pink could have created a more cohesive storyline. As it stands, they forsake props for colour and lighting as the song slows for the bridge. This is where the performance shots — previously wedged in — really stand out. It’s a great opportunity for A Pink to showcase their strength as a unit, as the choreography makes use of shifting formations and fluttering, intricate hand gestures that shine as the six girls move perfectly in sync. This is a step up from previous performances, and it pays off. The scenes switch from stark red lighting to monochrome, culminating in a striking shot of Namjoo, strung with fairy lights. They wind around her in sparkling trails, leaving her face in shadow. Yet the camera comes close enough to catch a stray tear running down her cheek. The moment is stunning in its simplicity. In contrast to the verses, which echoed the shifting uncertainty of the visuals, the imagery is strong and sure here. The girls gather around a decadent table to eat and drink in an elaborate parody of the Last Supper, before abandoning their decaying set once and for all. At the very end, they blow out the candles, and the song is done. “I’m So Sick” is produced by Black Eyed Pilseung, a new collaborator for the group, who have previously made Shinsadong Tiger their key partner. The departure is another smart move, as the duo imbue A Pink’s new sound with just enough sonic trends to hook the listener while serving something intriguingly off-kilter. The track opens with a rush of hauntingly distorted vocals to set a tone that dips into darkness while never letting go of its central groove. Although the chorus doesn’t serve as much impact as the build in the verses suggest, the “bye bye” refrain creates a perfectly sticky hook you’ll need to put on replay. The members’ breathy vocal performances perfectly complement the vibe of the song, which rides on an ebb and flow of lush synths and electronic flutters to create a distinct earworm. While the tropical-house tinged dance number is upbeat, the quirky moments in this bubbly mix add a touch of melancholy that’s driven home by the strength of Bomi and Eunji’s vocals. Particularly for the height of summer, this song’s edge is an unusual choice for a girl group release. But A Pink pack in enough pop punch to carry their shift in style. 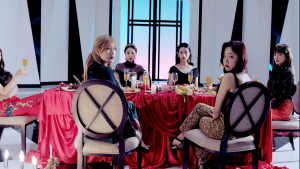 Whether it’s truly original is another matter – the final table scene is reminiscent of a similar shot used both in Black Pink’s “Whistle” and Red Velvet’s “Automatic”. The song itself evokes the synth-driven sparkle of Chungha’s “Roller Coaster”, also produced by Black Eyed Pilseung. These moments are a little jarring, but unsurprising homages for a group testing out a new sound. For their first foray into experimentation, A Pink have proved the most important point – after seven successful years in the business, they have much more to offer than we’ve seen so far. Here’s hoping the group choose to delve deeper into this darker concept, and stick to it as staunchly as they did with bubble-gum pop and preppy cuteness. Whatever comes next, if it’s as deftly styled as “I’m So Sick”, A Pink will be sure to shake things up.